Thank you, thank you, thank you. As you read last month, we were hit by several unexpected needs — roof repair, a new heating system for the volunteer dorm and replacement of the computer system which controls audio in all of our studios. Thanks to your financial support and your prayers, our mission is surviving these sudden hits. As we continue to labor on behalf of our thousands of remote listeners, we thank Our Almighty Father for your ongoing kindness to us and your thoughtfulness to the people whom we serve. May He bless you and those you love with every good thing. Thank you again! “ROOF” WORK: (left) Dan Scholten holds on to a safety line as he repairs the KNOM studio building’s roof. As we wrote you last month, we were horrified to discover that in 16 years, the brutal Nome winds had loosened most of the sheet metal roofing’s screws. Without repair, sections of roof were in danger of being torn off by a future storm. WINTER IN AUGUST? Most folks don’t think of August as a winter month, but on the average, Nome sees its first frost of the winter on August 19th. FUEL FOR THOUGHT: The recent summer oceangoing barge deliveries pegged Nome’s gasoline at $5.39 a gallon and fuel oil at $6.79. In the villages, they’re a dollar or two higher. It’s frightening to think that for many homes, winter heating costs will exceed $1,000 a month! 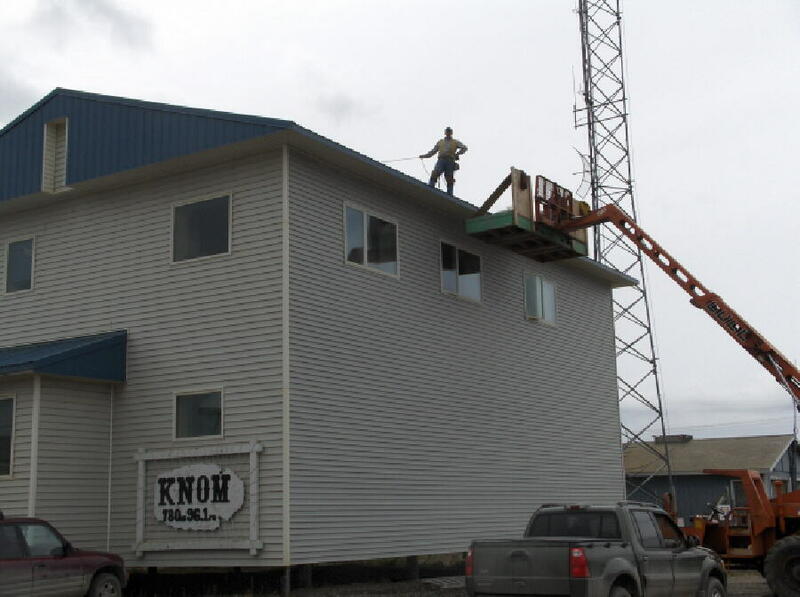 KNOM is the oldest Catholic radio station in the United States, on the air to bring worship, inspiration, positive companionship, education, news and information to far-flung villages throughout Western Alaska. Virtually all of our income is from good people like you. Thank you! INSPIRATIONAL SPOT: Oh, Lord, in my present need, help me believe that You are aware of my anxiety and will do what is best for me. Give me the strength to trust You and to put the present and future into Your merciful hands. Grant this through Jesus Christ, Our Lord, Amen. INSPIRATIONAL SPOT: Justice is getting what you deserve. Mercy is not getting what you deserve. Grace is getting more than you deserve. MANY HAPPY RETURNS: (left) KNOM volunteer inspiration director Dave Dodman has decided to stay on for a third year of service. 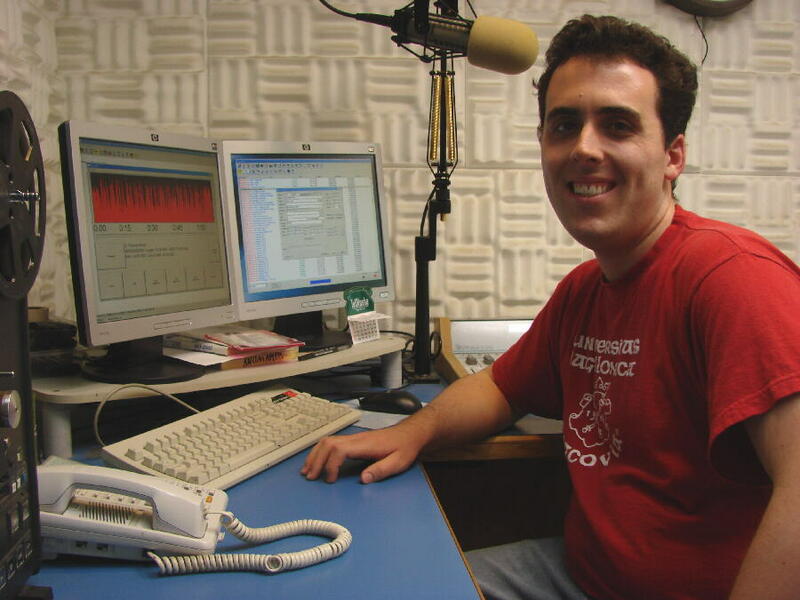 Dave, who also cheerfully announces the morning program, is known for his broad smile, as well as an ever willingness to go out of his way to help someone. IGNORE PREVIOUS MESSAGE: It’s true that we have two National Association of Broadcasters Marconi Religious Station of the Year Awards, but it turns out that for 2008, we were mistakenly told that KNOM is a finalist. So, maybe not this year. Still, our mission has been honored with every major broadcasting award. That’s because we truly care for the scattered flock in rural Alaska, and together with you, we provide them with a sparkling offering of programs, 24 hours a day. Thank you for your help! HISTORIC INSPIRATIONAL SPOT: You know the story of St. George the dragon slayer, the knight in shining armor who rides into a North African town and hears about a fire-breathing dragon that demands the locals send a regular human sacrifice. As it turns out, the victim of the day is a beautiful princess. They are. He does. There’s a big celebration. St. George and the princess live happily ever after. It’s a great story, but it’s not true. That version of the tale was written about a thousand years after the real St. George died a martyr to Roman persecutions in Palestine around the year 300. Nothing else is known of George’s life. Nevertheless, he is the patron saint of Boy Scouts, Germany, Portugal and England. His symbol, a red cross on a white background, even became part of England’s flag. INSPIRATIONAL SPOT: God loves YOU infinitely, completely, unbelievably, without hesitation, fatherly, mercifully, through others, ‘til the end, without end, unconditionally, absolutely positively, no doubt about it, faithfully, joyfully — perfectly! IT COMPUTES! 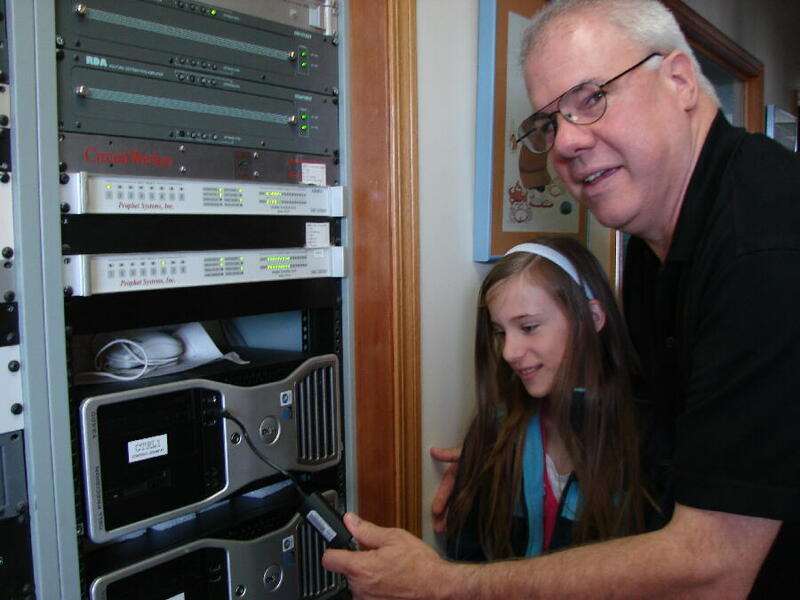 (left) General manager Ric Schmidt shows daughter Rosa two of KNOM’s audio computers. In June, our master computer system failed catastrophically, mandating a painful $59,396 replacement. It records and plays back audio in all of the studios, and operates KNOM unattended throughout the night. TWO TIMER: Former general manager Tom Busch wound up making two trips to Nome in July. With Ric Schmidt and family on vacation, Tom came to lend a helping hand, and again to continue annual preventive maintenance on the 25,000 Watt transmitter, replacing two large capacitors that were showing signs of imminent failure. Another former KNOM’er, fellow engineer Les Brown, was also in Nome in July to fix small dings and ensure that KNOM’s technical operation was ship-shape. To their horror, Tom and Les realized that between them, they have over 90 years of broadcast engineering experience. Les joked that in five years, it will be one hundred! TOPICALLY: Topics you would have heard discussed recently on KNOM included ethnobotany, the science of the relationships between cultures and plants. Experts also spoke of the Internet in Alaska, law enforcement in the bush, archaeological discoveries, the ingenuity of the Bering Sea Eskimo, and the difficulty rural residents have getting drivers’ licenses and IDs, among many others. Thank you for helping provide our extremely isolated listeners with information that is important to them! 22,600: That’s how many inspirational spots KNOM has broadcast so far this year, along with an equal number of educational ones, thanks to you. Thank you! Please consider adding the KNOM mission to your will. We prayerfully place all such gifts into funds that provide for emergencies and future major improvements. INSPIRATIONAL SPOT: Let your smile be sincere and friendly. Your cheerfulness will infect the people around you. Your smile can encourage the discouraged and help the hopeless. So be of good cheer! You have hope in Christ and you can bring that hope to others. Truly, you can help make your world a better place. FORTY YEARS AGO: He’s been on loan to the St. Marys Mission for months, 175 miles to the south. In August 1968, Paul Dieser returns to Nome to become founding chief engineer for the future Catholic radio station. THIRTY YEARS AGO: In his three years at KNOM, volunteer Mark Hoelsken has produced some unusual remote broadcasts. As a great last chapter in August 1978, he provides live coverage as Fish and Game biologists rescue a moose that had been chased into the ocean by loose dogs. On August 26, 1978, Mark enters the Jesuit novitiate in Portland, Oregon. (Left) In April, 2003, KNOM spiritual director Fr. Mark Hoelsken, SJ, visits with then-assistant program director Kelly Brabec in Studio A, the station’s master control. Fr. Mark departed KNOM in 2006, and Kelly has been KNOM’s program director for the past three years. TO NEW THINGS: Last month, we had room for only a brief mention of volunteer production director Kristina Proctor, who departed after a year of dedicated service. Kristina is looking forward to a year working with children in the inner city. After that, with an eye toward a career, she plans to head back to school to learn radio broadcast engineering. We know that you join us in wishing Kristina a bright and happy future. Kristina, thank you and may God bless you greatly! 55� AND 34�: Those were Nome’s high and low temperatures in the fourth week of July. This is a time of year when villagers leave their tiny communities for even more remote points in order to fish. KNOM is their only contact with the outside world. Once more, thank you for helping us to serve them with spiritual inspiration, information, education and companionship. You and all of your intentions are in our prayers every day. May God bless you abundantly!